iCloud preference pane as it appears after setting up your iCloud account. iCloud, Apple's solution to cloud-based storage and syncing, includes a free web-based email account that you can access from any Mac, Windows, or iOS device via the iCloud website. Launch System Preferences by selecting the System Preferences item from the Apple menu, or by clicking on the System Preferences icon in the Dock. In the list of preference panes that opens, select iCloud. If you haven't enabled your iCloud account yet, the iCloud preference pane will ask for your Apple ID and password. Provide the information, and click the Sign In button. Use iCloud for Mail, Contacts, Calendars, Reminders, Notes, and Safari. Place a check mark next to one or both sets of available services. For this guide, be sure to select, at a minimum, the Use iCloud for Mail, Contacts, Calendars, Reminders, Notes, and Safari option. You'll be asked to enter your iCloud password to set up iCloud Keychain. We recommend using the iCloud Keychain service, but it needs more attention from the user than simply filling in this form. We recommend checking out our Guide to Using iCloud Keychain for additional information, and simply clicking the Cancel button at this time. The iCloud preference pane will now display your iCloud account status, including all the iCloud services to which you are now connected. You should see a tick mark in the Mail check box, as well as quite a few more. You have now set up your basic iCloud services, as well as added your iCloud Mail account to the Apple Mail app. You can verify that the Apple Mail account was created for you by launching Apple Mail, and then selecting Preferences from the Mail menu. With the Mail Preferences open, click on the Accounts icon. You'll see the details for your iCloud Mail account. That’s it; you're all set to start using your iCloud Mail service with your Apple Mail app. iCloud Mail is part of the Mail & Notes service of iCloud. To enable iCloud Mail, place a ​checkmark next to Mail & Notes. If this is your first time using iCloud Mail & Notes, you'll be asked to create an email account. You're allowed one email account per Apple ID. All iCloud email accounts end in @me or @icloud.com. Follow the instructions to create your iCloud email account. Once you complete the email setup, you can exit the iCloud preferences pane. Don't use the Sign Out button to exit; just click the Show All button near the top left of the iCloud preferences pane to show all of the available system preferences. Quit Apple Mail, if it's currently open. In the System Preferences window, click the Mail, Contacts & Calendars icon, located under the Internet & Wireless section. The Mail, Contacts & Calendar preferences pane displays the current list of mail, chat, and other accounts in use on your Mac. Scroll to the bottom of the list and click on the Add Account button, or click the plus (+) sign in the bottom left corner. A list of account types will display. Click the iCloud item. Supply the Apple ID and password that you used to set up iCloud earlier. The iCloud account will be added to the left-hand pane of accounts currently active on your Mac. 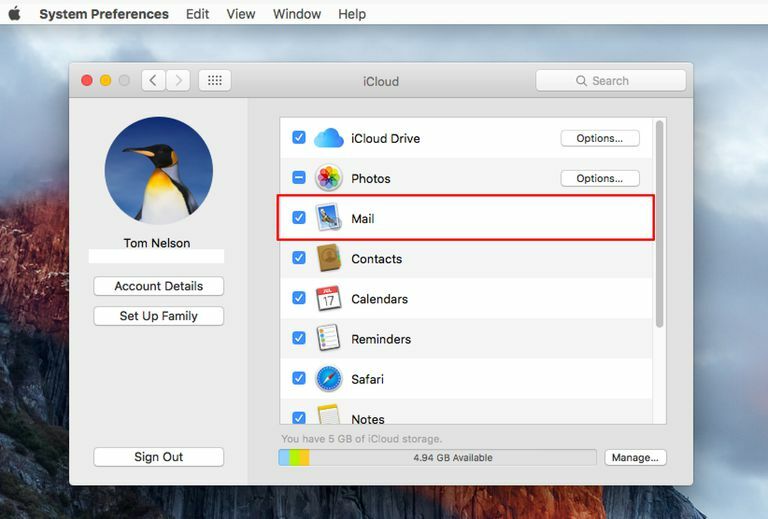 Click the iCloud account in the left-hand pane, and ensure that Mail & Notes has a check mark next to it. You should now have an iCloud account listed in Mail's Inbox. You may need to click the Inbox disclosure triangle to expand the Inbox account list. Send a test message to one of your other email accounts. Wait a few minutes, and then check Apple Mail to see if the test message came through. If it did, dash off a reply, and then check the results in the iCloud mail system. That's all there is to setting up the Apple Mail application to access your iCloud email account.